Chapter 2: "Raiders of the Fever Sea"
“Raiders of the Fever Sea,” a Pathfinder RPG adventure for 4th-level characters, by Greg A. Vaughan. A gazetteer of Golarion’s many oceans and seas, and an exploration of the various aquatic races that inhabit them, by Adam Daigle, with Patrick Renie, F. Wesley Schneider, and James L. Sutter. A journey to Butcher’s Rock and deadly cyclopean prophecies in the Pathfinder’s Journal, by Robin D. Laws. Six new monsters, by Jesse Benner, Mark Moreland, Steven D. Russell, and Greg A. Vaughan. 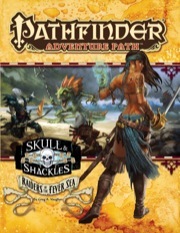 Raiders of the Fever Sea is sanctioned for use in Pathfinder Society Organized Play. The rules for running this Adventure Path and Chronicle sheet are available as a free download (479 KB zip/PDF). The feedback I've read here is fair. The beginning is excellent, the middle is monotonous, and the dungeon crawl at the end is an OK capstone to the adventure. Fortunately as a DM, I read these reviews and tweak the modules accordingly...which is probably why you are reading this, too. To make it fun, you have to break up the monotony of the sandbox. I created a few of my own ships with their own captains. I added a few twists here and there: a Nidalese military vessel, an Aspis Consortium vendetta, and a trip to Mediogalti Island, to name a few things to make the adventure stand out. It worked, but it required a bit of work on the part of the DM. It also helped to generate some random crew members and give them random personality traits, too...the players were really into making their ship and crew memorable, not just a bunch of lackluster followers. Something I didn't anticipate, though, is that the power level of the encounters at the end are a bit unbalanced. If run as written, the canopy creeper would have easily been a TPK, the group after group of sahuagin would not have budged even a dent in party resources, and the final encounter would have been a pushover. It's almost a clone of the dungeon in the first module. If I had it to do over, I would have added a few gimmicks to the bland groups of sahuagin, and also made sure to check and recheck the powers of the boss monsters. I'm reviewing this from the point of view of a party that likes a campaign to be a living story more so than a hack and slash fest. The problem with this installment is the fact that it fails to advance the plot in any meaningful way. Yes, there's lots of freedom in where your newly minted pirates can go and what they can do, but in the end it all means very little. After raiding a couple of ships and a couple of villages, the pirates quickly find out that a pirate's life is pretty monotonous. You pull up to a boat, you hop over, slaughter the crew, and move on. Sell plunder and ships at port, boast about your accomplishments. Rinse and repeat ad nauseam. There are several plot-based events which are great, definitely the high point of this installment. Overall, my players were mostly bored with it. There is really only one NPC that they get to interact with extensively in the book, which is generally the most fun part of the game for us. I'm sure this is great for a party that loves to sail around and slaughter innocents by the dozen, but if you're looking for a story-driven creative outlet, this isn't it. Plot-Spoilers ahead!- The pirates now have a ship and begin to be pirates. The player have a chance to grab an island for territory, make some alliances and explore an sunken dungeon. 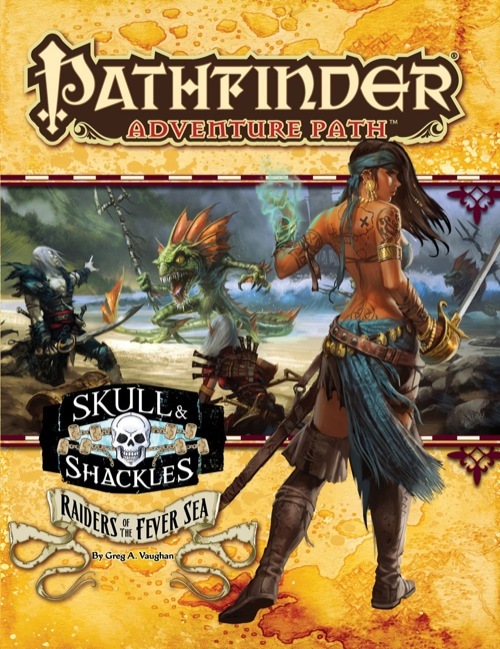 At the end of the adventure, the players will move from small time pirates to Full Free Captains of the Shackles. GM Impressions-THIS IS THE ADVENTURE TO MAINLINE PIRATES! We’re past the level 1 problem of the first adventure. Now the players get to go be real pirates, and ITS AWESOME! I had a blast. The players had a blast. IF YOU WANT TO PLAY ANY OF THIS ADVENTURE PATH, THIS ADVENTURE IS THE ONE! Good-You’re FINALY pirates in Pathfinder. You have a ship, and you set sail. The PCs can go ANYWHERE! Bad-This is an improve heavy adventure. The PCs just go after ships. The book has some basic ships and a basic village they can attack. You as a GM have to make it entertaining. Its not hard, but you have to put in a little bit of leg work to make this fun. Also, get ready for underwater aquatic combat. If your PCs hate rules heavy combat, they will not enjoy that part. Fun, open-ended pirate adventure. Solid "A". After the somewhat brutal first book which allowed for little freedom, this was a major breath of fresh air. My players have long wanted to play with their own ship. Having the freedom to explore, visit towns at will, and set their own pacing is lovely. The NPCs in the early and middle portions of the adventure are intriguing and memorable, and the combats are mostly better scaled difficulty-wise than in the previous installment. This book is also stuffed full of iconic pirate-themed goodies, and some creative and memorable encounters as well. Nothing in this book is mind-blowingly bizarre or original, but it gives the players lots of room to forge their own story while progressing toward some more challenging encounters. Definitely in the better-half of the AP books I've run, and worth every penny. First Pett, then Vaughan. My vote for "most deadly AP" goes to S&S! Finding buried treasure is always cool. Nice, a chance to become pirates and a gazetteer for the deadly denizens of the deep. I don't think there is going to be restrictions but as you said might be hard for good characters. Plus Paizo has already said they are recommending Paladins won't work. This sounds like it will be the first AP where evil characters might work real well and good characters less well. No alignment restrictions. The Player's Guide will talk about how one might play a good character in this AP. Paladins are likely to be the only "casualty" of it all. Alright, this and my subscription schedule are teasing me that I might actually get two chapters of AP goodness all at once, in March. Is this true, or just a cruel prank? Also, we're really rocking the gods throughout this AP. Besmara (thank you SO much, my cleric in Savage Tide worships her), Torag and Norgoober? Quite a divine lineup. I am having difficulty deciding what I'm most excited for, this or the interplanetary stuff. You guys really have a strong lineup this year. It's true that the release planned for December slipped to January, which means there will be a double-up month when we get back on schedule. The website data currently paints an optimistic picture of that happening in March, and we'll do our best to make it happen sooner rather than later, but I suspect that in reality, the double month will probably once again be August. But isn't it July that's usually a double month, with either August or September (I can't recall which) being a "no adventure path" month? I'm not complaining, my wallet is ready to commit hari-kari, I'm just wondering if you're saying that the "late" adventure path will be caught up during the usual double month in the summer. August ended up being the double month last year, when we got part 6 of Carrion Crown and part 1 of Jade Regent in the same shipment. The confusion might be that the August shipment actually started shipping during the end of July due to GenCon's very early August date. No confusion, I was just too lazy to be precise :) If I recall properly, pretty much every year there's been one double (or even triple) adventure path shipment, and one month where there's none. Final cover image and product description now up! We need a Wallpaper of this (still unnamed) Hottie! Only one support article... does that mean the exploration of Golarion's seas will be double-sized? The ocean article got too big (and is, arguably, too important to this, a very nautical themed AP)... we'll be doing an article about Torag at a later point in this AP if all goes according to plan. No pressure. The 2x sized Crown of the World back in JR#3 was a great move. I'm sure a similar mentality is driving this one. I just can't imagine how Torag fits into S&S without some weird shoehorning. I believe the Hurricane King has a ship fully loaded with firearms from the gunworks of Alkenstar. Or, more precisely, the gunworks that are a result of the dwarves in the region making guns. So, that could be a means of bringing in Torag. Seriously though, a double-length ocean article sounds great! Loving the cover art on this one, very exotic looking. Should we expect emails this coming week or the following week? According to the "My subscriptions" page, they should be sending emails out on May 11th. Actually, it was the 10th. Or at least I got mine on the 10th, so the book should start shipping to subscribers on Monday. I got my email that says it is due to ship next week tonight. This may sound off topic but it is most definitely not. Yup, I received my email on the 10th. They've already deducted the money from my account! AHHHHHHH YEAH! EDIT: Looking at the top of the page, it says I purchased it yesterday. Yeah it shows that once they put a hold on your money. Mine says I bought it Thursday. That is because once they put a hold on the money it is to late to change the order I believe. Hopefully Monday we will see them going out so we can get access to the PDF's. the chick on the cover is hot! And needs to be a Wallpaper! Is her character portrait available without the rest of the cover? Paizo seems to be really good about releasing their bad-@$$ character art, but I cannot seem to find this one anywhere! The PDF will be available for purchase to non-subscribers on May 23. Subscribers should be gaining access to the PDF sometime this week. Sweeeeet! Now if I send you one dollar in the mail can we make that happen sooner rather then later? At the very least that will get you a candy bar. Try a box of very high end chocolate. Is the similarity of Lady Smythee and B. Jenet from King of Fighters intentional? Because I found myself laughing pretty hard when I saw her picture. EDIT: Even their backstories are similar. This has to be intentional. Just finished skimming through the pdf. So, when are we going to get the instructions for building our own ship, re the introduction? I'm really obsessing about finding a good model. The only 1/60ish (28 mm) scale ship out there that's not an arm and a pegleg is the Revell Pirate ship, but's kind of cartoonish. The paper model from Worldworks (the Maiden) is best I've found that's affordable, but it looks like a small nightmare to put together, and costly to print out. I cannot wait for the pdf! I haven't been this excited to read an adventure path since Kingmaker! That's the one Rob uses in our office game. Whatever it cost, both in money and time, was well worth it from a player's perspective. The model does wonders in increasing the immersion in the environment and helping with tactical situations involving the masts and various decks. Wait a sec, do you have the PDF for part 2? Subscribers, as part of their subscription, get access to the PDF when their subscription shipment goes out. This occurs prior to the street date indicated in the product above. I can't speak for the art, but I wasn't familiar with B. Jenet, so any backstory similarity is coincidental.